SmallBizDaily is powered by three people with a passion for entrepreneurship: Rieva Lesonsky, Maria Valdez Haubrich and Karen Axelton. We met at EntrepreneurMagazine nearly 25 years ago, when Rieva hired the rest of us as editors. We’ve been a great team ever since, so when Rieva decided it was time for her to stop talking about entrepreneurship and start living it, she naturally turned to us to be her business partners. At SmallBizDaily, we combine our decades of experience reading and writing about entrepreneurship with our new experience as startup entrepreneurs to share our unique take on the world of small business. Rieva Lesonsky is CEO of GrowBiz Media, a content and consulting company specializing in small businesses and entrepreneurship. Rieva has been meeting with, consulting to and speaking to America’s SMBs for nearly 30 years. Prior to co-founding GrowBiz Media in 2008, she was SVP/Editorial Director of Entrepreneur Magazine. Rieva’s energy and enthusiasm have helped inspire entrepreneurs nationwide. A nationally recognized speaker who regularly addresses audiences across the country, she has appeared on hundreds of radio shows and numerous local and national television programs, including CNN, Good Morning America, the Today Show, Fox Business News, The Martha Stewart show and Oprah and can regularly be seen on MSNBC’s Your Business. 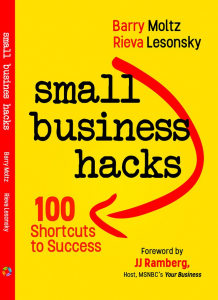 Rieva is also the author of several books about small business and entrepreneurship, including the bestseller Start Your Own Business. In addition to blogging on SmallBizDaily, Rieva regularly writes about small business for print and digital outlets including SCORE, Small Business Trends, SBA.gov, Network Solutions/Web.com, ReadWrite, American Express OPEN Forum, AT&T, Success Magazine and Groupon. She has been named to Folio Magazine’s “Folio 40” list, which honors publishing’s top innovators; has been named a Small Business Influencer by SmallBusinessTrends.com; and has been inducted into the Business Journalism Hall of Fame. Many organizations have recognized Rieva’s tireless devotion to helping entrepreneurs. She served on the Small Business Administration’s National Advisory Council for six years, and was honored by the SBA as a Small Business Media Advocate and a Woman in Business Advocate. The Collegiate Entrepreneurs Organization honored her for helping drive “the entrepreneurial revolution in secondary education,” and the ASBDC awarded her a “Champion of Small Business” award. She has received the “Champion of Small Business” award from the Association of Small Business Development Centers (ASBDC) and the 2012 Lou Campanelli Award from SCORE in recognition of outstanding leadership, vision and philanthropy in support of small business and entrepreneurship. Maria Valdez Haubrich is former Executive Editor of Entrepreneur Magazine, where she worked for over 20 years. At Entrepreneur, Maria’s savvy marketing mind helped develop custom publications, online content and other editorial products for B-to-B marketers seeking to reach small-business owners. Along the way, she’s learned a lot about everything from printing, design and production to project management, tech troubleshooting and how to work a trade show booth. Karen Axelton is former Executive Editor of Entrepreneur Magazine and former Editor of Entrepreneur.com. Karen has been tracking small-business trends for more than 20 years. She loves finding out about innovative entrepreneurs, business ideas and marketing methods, as well as consumer and demographic trends. A former marketing copywriter, Karen once spent six months working at a big corporation, where she discovered that for many people, “Dilbert” isn’t a joke. The experience inspired her to support small businesses in any way possible.